Call Me Kuchu is a documentary film seeking to explore the many struggles of the LGBTQ community in Uganda, where a new bill has threatened to make homosexuality punishable by death. The word “Kuchu” is a self-descriptive word of Swahili origin as a way to refer to homosexuals in Uganda. The film especially follows Uganda’s first openly gay man, David Kato, who works with fellow activists to defeat the new legislation while simultaneously resisting persecution in their daily lives. After the tragedy that is the brutal murder of Kato in a homophobic attack does the international human rights community has its attention grabbed. Holden, Stephen. 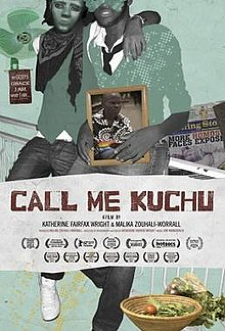 “Where Being Gay Is a Life-and-Death Struggle: Fighting Uganda’s Anti-Homosexuality Bill in ‘Call Me Kuchu.’” The New York Times (New York: NY), June 13, 2013. Kit, Zorianna. “Call Me Kuchu: Documentary Review.” The Huffington Post (New York, NY), June 26, 2013. Ondrus, Suzanne. “Call Me Kuchu by Katherine Fairfax Wright and Malika Zouhali-Worrall, and: God Loves Uganda by Roger Ross Williams (review).” African Studies Review 57, no. 1 (2014): 244.246. Rose, Steve. “Call Me Kuchu – review.” The Guardian (London, England), Nov. 1, 2012. Crémieux, Anne. “Call Me Kuchu: Analyse du documentaire américain de Katherine Fairfax Wright et Malika Zouhall-Worrall.” Africultures 96, no. 6 (2013): 160-163. Hart, Carrie and Rick Dillwood. “Call Me Kuchu: Post-colonial dynamics in transnational LGBT filmmaking.” Feminist Media Studies 15, no. 6 (2015): 1009-1024.